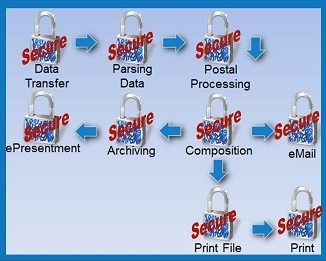 electronic security sending data with data encryption in phoenix az and tuscon az. As part of Direct Digital’s security, we utilize eSecure for all data file transfers. eSecure begins as soon as you press the ‘send’ key. All of the data files are 100% encrypted until received by the recipient that has the password to unlock the encryption. If the data file is compromised in any way, it is automatically shredded and permanently destroyed. eSecure allows you to maintain control and monitor the data for whatever length of time you set: a day, month, week or year. Track and monitor access logs to ensure the right person is accessing your data. You can also receive notifications anytime s the file is being touched. Find out how your data can be safe and secure with Digital Data. Started in 1998 by Chuck Seifert, today, Direct Digital is a division of Digital Data Centers. Together, we are a premier provider of automated invoicing, electronic archive, document printing and payment management services. Continuing on our strength in variable print, Direct Digital offers an array of printing solutions including digital print, Nexpress, and production mail. Direct Digital is an SSAE 16 certified corporate communications center utilizing paper, mail and web-based solutions.